Hello and welcome to this online exhibition to celebrate UK Disability History Month (UKDHM). This is their third year of celebrating this hidden history and includes important dates such as the International Day of People of Disabilities (3rd December) and International Human Rights Day (10th December). A key theme in this year’s celebrations is the theme of change within the lives of disabled people and acting as “agents of change” fighting against people’s attitudes towards this community. You can find out more about UKDHM by visiting their website here. Individuals can feel incredibly isolated due to the impact their disability has on their life. Women with a disability may find it hard to socialise due to physical or mental factors that impact on their wellbeing. The newsletter grew from its initial small size and became a wealth of information for women. Later issues cover various topics ranging from book reviews to information about meeting groups to creative writing. 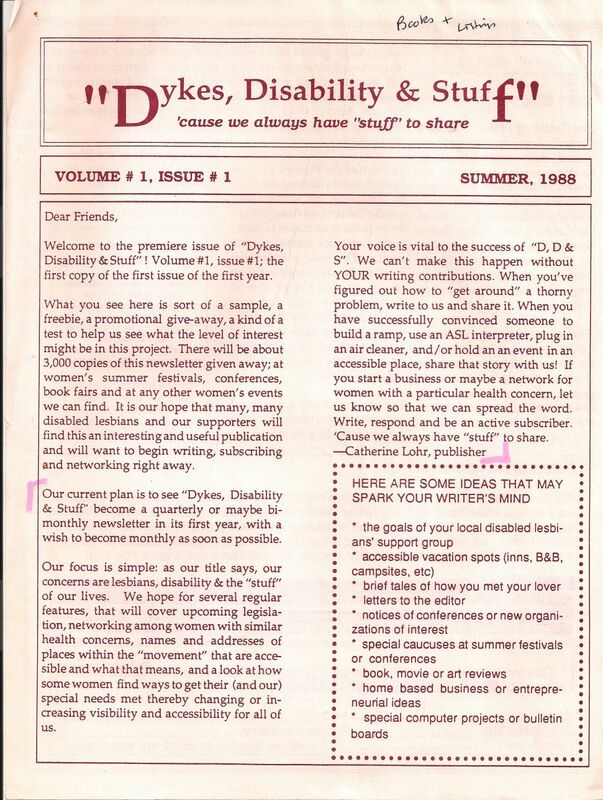 The newsletter also became a safe space for disabled women to discuss topics relating directly to their disabilities and the impact this had on their every day lives. A frequent theme in women’s contributions to the newsletter is the lack of understanding of their disabilities, even from close friends and family members. Dykes, Disability and Stuff was a platform that allowed these women to express their fears, their achievements and their hopes for the future. In the days of the internet, it can be easy to forget how difficult it could be for disabled women to access information. 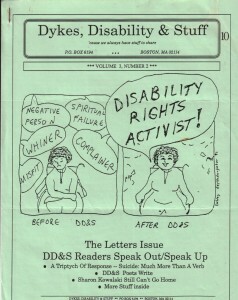 Dykes, Disability and Stuff was available in a variety of formats, including audiotapes, large print and Braille. Their producers aimed to be as inclusive as possible: they welcomed contributions from non-lesbian women if it was “relevant to our primary readership.” In one issue a women, identifying as heterosexual, asks for advice relating to her disability and her decision on whether or not to have child. 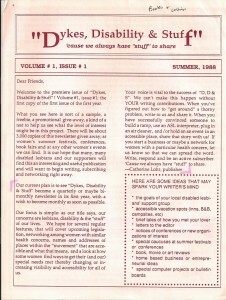 The newsletters editors appeal to their readers for advice on her behalf, one disabled woman to another. 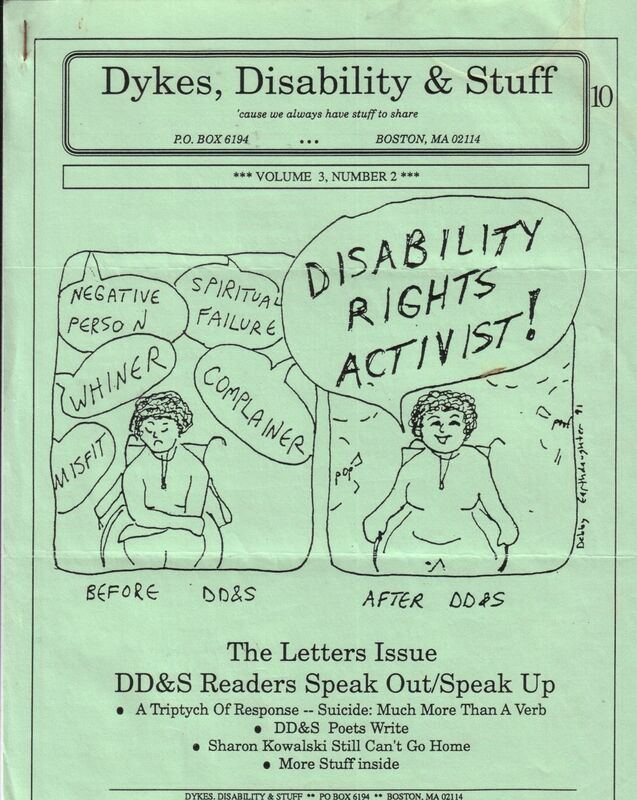 Dykes, Disability and Stuff was a beacon of hope amongst disabled lesbians. It encouraged its readers to become activists for change by challenging the ableist society they lived within. The newsletter empowered its readers by sharing their stories and experiences. For many disabled lesbians it was a beacon of hope, that reached out from their letterbox. We hope you’ve enjoyed this peek into the collections held at Glasgow Women’s Library. If you would like more information about ‘Dykes, Disability and Stuff’ or the other collections held with the Archive, please contact our Archivists Laura Stevens or Lindsey Short. This entry was posted in Featured, From the Archives, The Collection blog, Themed Timelines.